There's a lot more to rabbits than meets the eye. If you're considering a rabbit as a pet or just trying to learn a more about rabbits in general, it's a good idea to educate yourself about their skeletal parts and structure. There are 23 types of bones that make up a rabbit's skeleton: Cranium, scapula, spine, fibula, tibia, femur, ilium, sacrum, caudal vertebrae, calcaneus, tarsus, metatarsus, phalanges, ulna, ribs, radius, carpus, metacarpus, sternum, cervical vertebrae, atlas, mandible and maxilla. In 1965, it was discovered 51 percent of a rabbit's skeleton is marrow, with 2/3 in the flat bones and 1/3 in the long bones. Arthritis and osteoporosis is a common ailment for old rabbits, making it difficult for them to move around and care for themselves. A rabbit's skeleton is less dense than that of a cat's, making up only 7 percent to 8 percent of its body mass, and can break easily from rough handling. Gentleness is a necessity when considering a rabbit. Never drop or squeeze a rabbit as broken backs and dislocated limbs are extremely common. Just like with your own body, a well-balanced diet of fresh vegetables and plenty of exercise will help keep your rabbit's skeleton healthy and strong. There are aids available from your rabbit's veterinarian as well as many that learn to scoot and pull themselves around without aids. 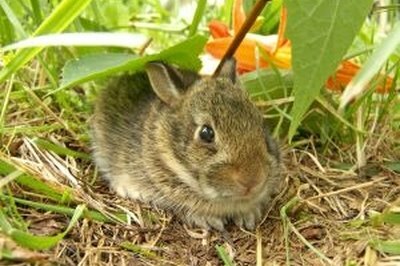 Caring for a disabled rabbit takes a little more diligence but can be done.